Karthspire Camp is an open sprawling Forsworn encampment located northwest of Old Hroldan Inn. It is inhabited by a large number of Forsworn and a hagraven. Lower level players (below 15) should take serious caution when entering this area, if not just avoid it completely. 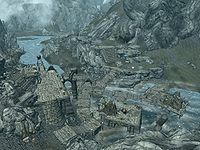 The main route to find the camp is from the main road from Markarth heading east over the first bridge (to the right of where the Khajiit caravan camps). On your right is the path that leads to Dushnikh Yal. At the crossroads take the road signposted to Riften, Whiterun and Windhelm. You then pass Reachwater Rock on your right and cross the next bridge heading east-southeast. Continue past an overturned cart until you come to another bridge, this one on your left heading north-northwest. This leads directly to Karthspire Camp. The camp is sprawling and built on several levels with the main level being built on a series of wooden platforms the Karth River linked via wooden bridges. 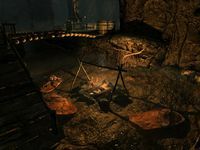 It is extremely difficult to approach the camp or take out the individual Forsworn guards without alerting the whole camp. From the above direction, you will come to steps leading up onto the first platform. This is where you will appear if fast-traveling to this location. There is a tent on your left with a Forsworn inside sat on a bench. In front of you is a pile of crates, barrels and sacks. On one of the crates is an apothecary's satchel, a sample of jazbay grapes and on a barrel is a medium coin purse. Be careful as right by the tent opening is a hole in the wooden platform. In front of the tent the platform continues to the northwest, with a wooden bridge leading to the northeast. Under this bridge is a nirnroot. Following the bridge you will come to a turning to the east. At this corner is another Forsworn. The path passes a set of stone stairs leading up to the higher levels of the camp, the first level has another Forsworn two bastions over looking the river in both the westerly and southerly directions. There is a tent and lit brazier between them. Inside the tent is only a hay pile. There is another wooden ramp by the top of the stone stairs leading to the highest level of the camp. To the right of the ramp is a barrel. At the top of the ramp you will find two more Forsworn, one of which is a magic user who specializes in frost magic. You also find a forge, grindstone and workbench with an iron sword on top. To the right of the forge are a total of three barrels, a hay bale, a sack and an unlocked chest. From the bottom of the stone steps the path continues to the east, you pass between two lit braziers and encounter the hagraven and her camp. This consists of a tent containing an alchemy lab, built-in to a wooden table with two apothecary's satchel attached to the front edge and boss level unlocked chest. On the alchemy lab is a blue mountain flower, an eye of sabre cat and sample of wheat. A campfire is lit in front of the tent. Further to the east is a dead giant laid out on a rock with a bowl in front containing a bowl of void salts and a giant's toe. Back by the initial tent, just past this is a path heading southwest up a wooden ramp to a camp fire guarded by a Forsworn, beside the fire is a bench and behind this is a hay pile. There is a flight of stone steps heading up to the south from this level, again there is a Forsworn guard, camp fire and bench. You access the Karthspire from this level through the cave entrance. It eventually leads to Sky Haven Temple. The main platform continues over another wooden bridge to the northwest and branches off to the northeast. This part of the camp has two Forsworn guards and contains a tent, a large table and benches, a rack with three hanging salmon. To the right of the rack are two crates with a leveled warhammer and a draught of enhanced stamina. On top of the table is an apothecary's satchel. Inside the tent is a hay pile, four sacks, a crate with a copy of the Block skill book A Dance in Fire, v2. Leaning against the crate is a hide shield. To the right of the tent is a crate and sack with two bottles of Nord mead on the crate, two benches and a tanning rack. To the right of the tanning rack are two leather strips. Continuing to the northwest from the junction over another wooden bridge is another Forsworn guard, a tent containing a hay pile, a barrel, three sacks and a crate with a bottle of leveled poison on top. To the left of the tent are three more barrels, on one of which has a sample of lavender, a woodcutter's axe is leaning against them, two crates, one of which has a leveled greatsword on top. The third barrel has a canis root and bulb of garlic on top. In front of these items is a ramp leading down to the water. Upon entering you are in a natural cave with a camp fire in front of you and a wooden ramp to the left of the fire, which leads up to the main living area. Beside the camp fire is a sleeping Forsworn guard and three bed rolls, behind these is an iron ore vein. Following the ramp up you will pass on your left a dresser with a potion of ultimate stamina and two random fear poisons. There are many food barrels around the cave, including two in the southeast corner, one of has three gold coins on top. To the left of these barrels is a table and chair with a small mead barrel and a fillet of salmon meat on top. There are two narrow wooden bridges across a small gap and between these is a small table and chair, a Forsworn guard is sat here. Crossing one of the bridges you will encounter the Forsworn Briarheart. There is a table next to a stone pillar holding a random potion, a thistle branch, a bowl of void salts, a bowl of frost salts and a wooden plate containing a rock warbler egg and canis root. There is a barrel next to the table with a lit lantern on top. There are three further bed rolls next to the north wall. In the southwestern corner is an unowned double bed, an unlocked chest and small table. The wooden planking continues to the west and then turns to the north, then continues until you reach a table holding a leather strip. It then turns back to the west. The tunnel opens out into a large open roofed cavern. There are stairs on your right against the northeastern wall. On the wall, just before the stairs start is a second iron ore vein. On the other side of the stairs is a juniper tree. Passing between two parts of a stone bridge structure, further back into the cavern, on the ground level is a tree stump with a mora tapinella growing on it. At the top of the stairs are three rotatable pillars with unusual symbols on. Unless you are here as part of the Alduin's Wall quest, or have already completed it this is as far as you can go. During this quest you unlock the stone bridge and cause it to drop into place allowing further progress to be made. There is a second juniper tree on the far side of the bridge and stairs leading south into a tunnel. The tunnel turns to the west again and open into a room full of pressure plate tiles on the floor. Follow the correct symbols to the pull chain that de-activates the traps and drops a second bridge over the previous large open roofed cavern, heading north. As you cross the second stone bridge there is another juniper tree on your right on a lower ledge only accessible by dropping down onto it. There is nothing else of interest there. Continue to follow the path into another tunnel that turns to the west and up some more steps. It then turns south again and you are now at the highest level within the large open roofed cavern. 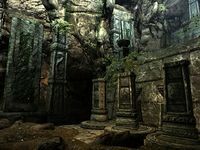 The path forward heads west and opens out into a large stone chamber with an unlocked chest in the middle and a quicksilver ore vein. This is the entrance to Sky Haven Temple. You need to activate the blood seal to gain entrance. 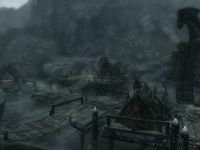 The entrance to the Karthspire is located above the camp on the western side of the river. A copy of the Block skill book A Dance in Fire, v2 can be found over a crate inside one of the lower tents. If the quest Alduin's Wall has been started, a dragon will spawn here. The quicksilver ore vein doesn't respawn. 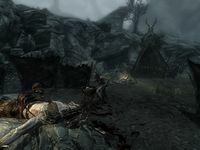 Karthspire Camp does not have a Forsworn Briarheart separate of Karthspire, and as Karthspire doesn't respawn it is the only Forsworn location that cannot be visited to examine a Briarheart for Neloth as part of his quest, unless this location hasn't previously been cleared. This page was last modified on 28 January 2018, at 16:08.